Based in Ventura, CA, The Thunder Boys, who formed in 2005, are one of the most-talked about new bands on Myspace.com. Fresh out of high school, the quartet pulls from the best rock n' roll influences around, including The New York Dolls, Johnny Thunders' Heartbreakers, The Jones, Rolling Stones, Hanoi Rocks.... well, you get the picture! 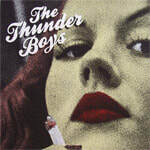 Can't Stop Drinking (About you) 7"
The Thunder Boys ...Are Go!